02/2013 With the approach of my February birthday, I decided to purchase a Singer 301A sewing machine manufactured the same year I was born…. L O N G ago. She arrived a little dirty but in perfect condition so with a day of cleaning and oiling, she was ready to go. Boy this baby hums and I love how fast she sews. Her stitches are beautiful and I couldn’t be happier about this inexpensive acquisition. I felt compelled to make a quilt top! 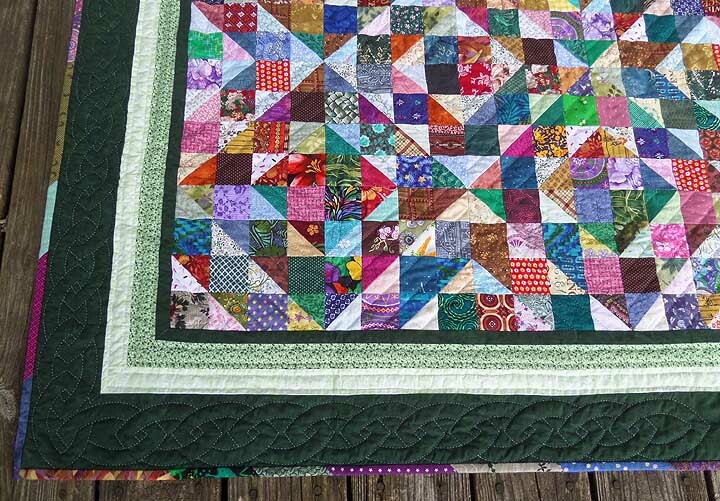 Since seeing a student-sewn partial top on Bonnie K. Hunter’s blog on June 29, 2012, I haven’t been able to get a Split-16 quilt out of my mind. Though I couldn’t find a free pattern online that matched the student’s top, I decided to come up with my own measurements and using the picture from the blog, I simulated the layout… and loved it! After much deliberation, the top was finished the first of May. It is now in the quilt frame. Update: 05/09/13 Quilting has begun! 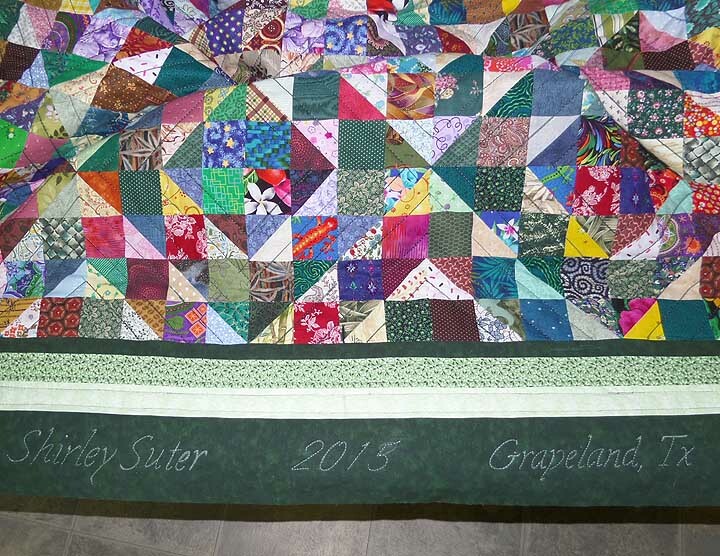 My name, location and date have been quilted. Hopefully, I can finish this quilt as indicated by the 2013 date! It’s a lot of quilting on a large quilt. Update: 01/03/15 Good grief! Has it really been that long since I worked on this quilt? How embarrassing to say this quilt remains in the frame. The quilting on the main body is nearly complete but no quilting has been done on the borders. I still can’t decide what to do with them. 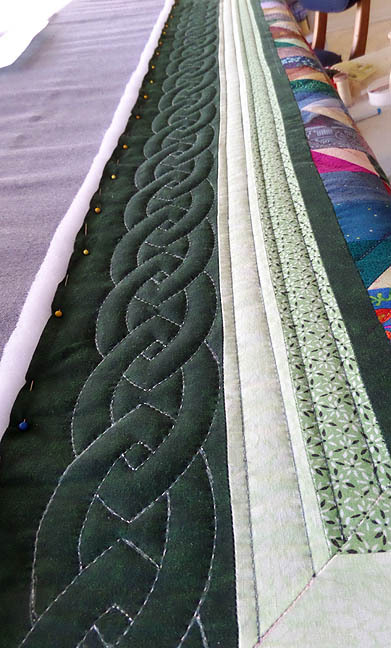 I am working on this today and hope to finish the main quilting soon <– we’ve heard this before! Update: 01/04/15 YIPPEE!!! The main body of the quilt is quilted! Now, I MUST decide how the borders will be quilted. I’m spending the evening looking for inspiration and doing research. I’m determined to finish this large quilt. Update: 01/22/15 Took several days but finally finished quilting the top borders. Feel funny quilting the top edge first but that’s what’s exposed and I will work what is normally backward until I get to the bottom and finish the quilt. I’ve begun marking and stitching the side borders. Fingers crossed I don’t get discouraged! This baby’s been in the frame WAY too long!! Update: 04/14/15 Was finally able to spend a little time with these borders. It seems any excuse or distraction pulls me away; first emergency sofa quilts, and now spring planting in the garden. I’m truly hoping to continue pecking away at these borders between watering the garden and soon harvesting veggies. Update: 06/07/15 TAH DAH! The quilting is complete and the quilt is out of the frame. Hopefully, between harvesting and canning garden veggies, I’ll trim the edges, cut, make and apply binding, give it a good hand washing and photograph it. It’s almost shocking to see the frame empty. It won’t stay that way for long! Update: 06/08/15 Easy date change from a ‘2013’ to a ‘2015’ and edge trimmed. Tomorrow I’ll cut and maybe sew some binding. Can hardly wait to see it bound and washed! 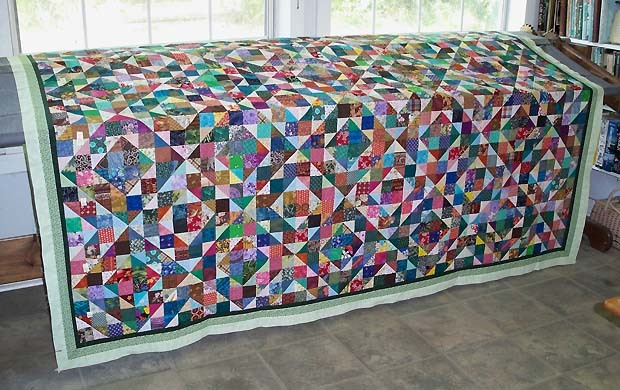 This is a BIG, heavy quilt… currently measuring 116″ x 102″, prior to binding. The finished measurements are 116″ x 102″ and will look pretty terrific as a bedspread on my antique queen size bed. 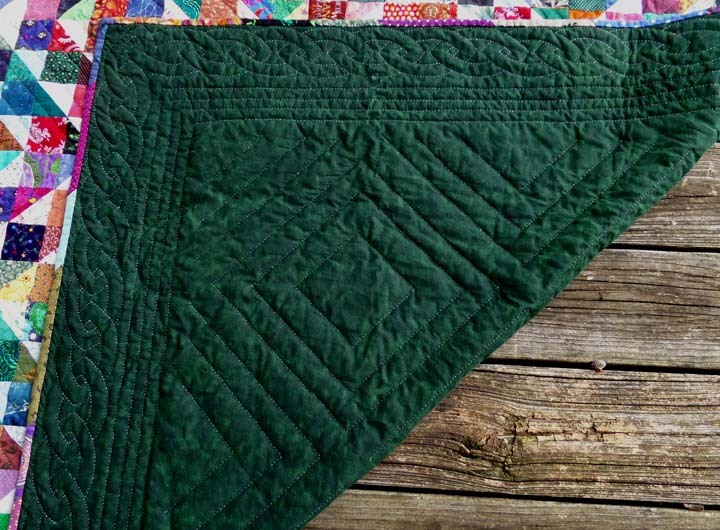 The backing is mottled forest green wide fabric and I’ve included a pieced strip across it (not pictured). It’s a nice accent on the ocean of green. I used YLI 40/3 ply ecru cotton hand quilting thread throughout. The finished quilt was hand washed. 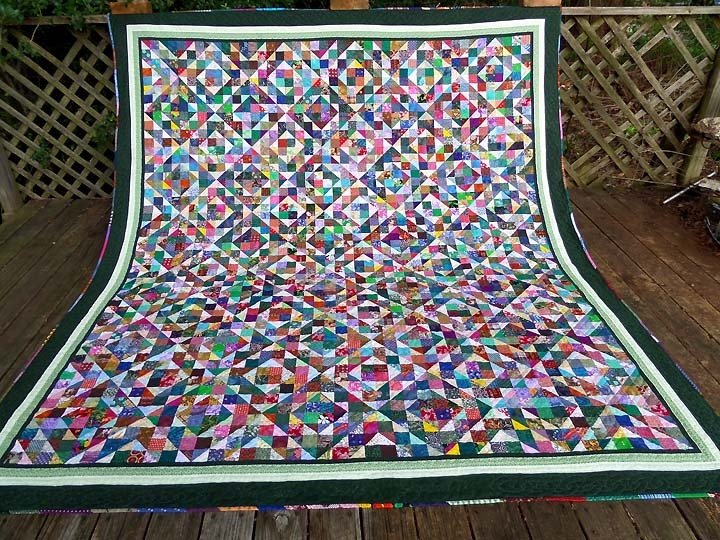 So glad you are quilting this! 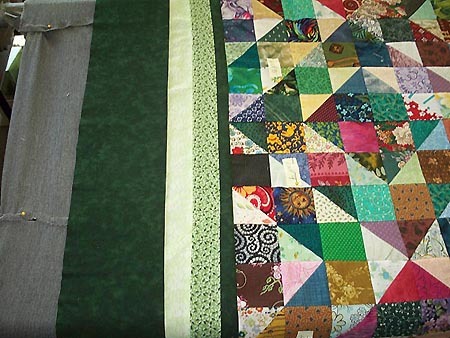 Can’t wait to see what artistry awaits your as your hands turn this quilt top into a masterpiece! Beautiful piecing btw! Enjoy your new to you machine!